Today’s radio fictions often try to pull listeners in with intricate production, artful editing, and heavy (to use a program-director term) sound-richness. But this tends to simply fill listeners with guilt about not paying attention: “Man, somebody worked hard on this piece. What a shame.” This American Life has built one of public radio’s most startlingly successful brands by refining their particular sensibility with intricate production, artful editing, and heavy sound-richness, but then, they run a Journalistic Enterprise of Facts — unless, of course, they wedge a bit of fiction into the week’s theme. (Or unless someone pulls a Daisey.) Some listeners feel faintly ripped off when Ira Glass announces a short story, skit, or dramatic monologue coming up, but a few minutes in, don’t they get caught up in it just the same? They certainly seemed to when This American Life aired The Truth’s “Tape Delay” [MP3]. The piece, a tale of a lonely man who edits and re-edits a phone conversation recorded with a failed blind date, showcases a sonic awareness that separates Mitchell and co. from other radio fictionalists. 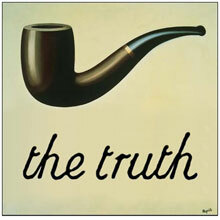 At its strongest, The Truth takes sound not just as its tool, and not just as its medium, but as its subject. The New York story “Interruptible” [MP3] juxtaposes the snappy, authoritative media presence of an FM relationship-advice guru with her real, boozy, yet no less sensible physical presence. The other New York story “Everybody SCREAM!! !” [MP3] — actually, they’re almost all New York stories, and they satirize just the kind of neuroses that make me live in Los Angeles — pits twitchily human thoughts in a struggle with the driving thump and chintzily amplified barking of a “spin” class. Bisson’s all-dialogue “They’re Made Out of Meat” becomes what sounds like a two-way transmission between alien intelligences evolved to the point of disembodiment. If you have ears to hear, you will respect The Truth, and not just because its mission seems so Quixotic. It aims for the world of listeners we’d like to be: attentive, empathic, adventurous, unfailingly engaged, aesthetically discerning, and appreciative of the technical points of soundcraft. You’ll come away from most of its episodes feeling seriously impressed by their inspiration, their construction, and their humanity. But whenever you go to play another, that little voice inside will always object: “What, you’re going to listen to something made up? Are you sure you’ve already listened to every real podcast you have?” Jonathan Mitchell must understand this. His program’s very title must reference this. But if any show can finally fire up that revival of fiction and theater on the radio, The Truth can. I admit that I ultimately tend to put my money on people who don’t need human nature to change — but I myself am probably not one of those people.